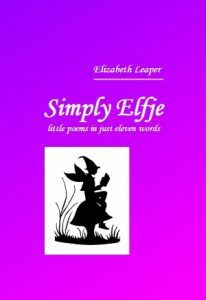 Blog | Silverburn Publishing | the home of Elizabeth Leaper's books. the home of Elizabeth Leaper's books. What a wonderful day I had at my local Library yesterday meeting the children who came in to sign up for the Summer Reading Challenge. The photo shows the calm before the storm. I had just set up, worksheet at the ready for the first to have a go at writing an Elfje. A few minutes later the library was a hive of activity with plenty of children and their parents taking part in the various activities set up for them – including a treasure hunt organised by the Librarians which had them buzzing around the place like flies. Many still found the time to stop and talk to the four of us authors (Barbara Mitchelhill, Ann Scantlebury, Jeanie Mehta and me) and have a go at our activities too. Most of the activity took place in the morning. Being a day when there was so much sport to enjoy on the television the afternoon proved to be rather quieter. Despite that it was a thoroughly enjoyable day and, if asked, I will happily do it again next year. This coming Saturday, 14th July 2018 sees the start of the Children’s Summer Reading Scheme. 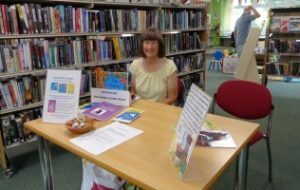 When the children come to my local Library to sign up for the scheme they will find several published authors on hand to talk to about anything and everything to do with writing books – how to go about it, how they are illustrated, how to stimulate your imagination and so on. As well as answering questions on these and other book related topics I will be there giving short workshops on how to write Elfje poems and encouraging them to write their own. The event runs from 10.00am to 4.30pm. It is hoped that parents and others interested in the publishing process will also find the event helpful. I have been invited once again by my local Library to read to groups of school children from the local primary school on library visits. I love doing this, it was one of my highlights last year and I think it is wonderful that children are being introduced to libraries at such a young age. 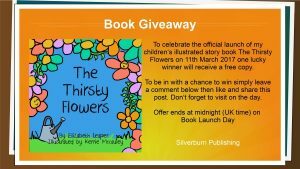 I shall be reading ‘The Thirsty Flowers’ to two groups of Reception Class children (4-5 year olds). The first event is tomorrow, 18th January and the second is on 25thJanuary 2018. I will be joined by Ann Scantlebury, another local children’s writer, who will also be reading one of her stories. The children will also take part in some library based activities aimed at helping them to understand how to use the library. Well I thought it was going to be easy but nothing is ever as easy at it seems! I have hit a bit of a snake with the formatting and the e-book version of ‘Simply Elfje’ is still not ready. I apologise for the delay but rather more pressing priorities have not helped. I will get to at as soon as possible, however it will still be a few weeks before this version is available. In the meantime I do now have a small stock of the print version. If anyone is having problems obtaining a copy on line please contact me about purchasing direct. You can also order direct from me via the ‘Contact’ page if you would like a signed copy. My latest book “Simply Elfje” is now available to buy from Amazon. This is a new direction for me – as an Indie publisher it is difficult to get my books onto Amazon so I have chosen to publish this book of little 11 word poems via Amazon’s CreateSpace platform which does allow me entry onto Amazon. This also means I can easily create an e-book version and I will do this in a few weeks time. Hopefully it will be ready by early May. You can find more about the book on my Books page where you will also find a link to Amazon for purchasing. I do not currently hold any stock myself but will do so soon at which time I will add a PayPal button. It may interest you to know that as far as I am aware this is the only book of Elfje poems available in English. Previously the verse form has been confined to The Netherlands, where it was developed. Let’s help spread the word! On 9th March I was invited to the local Library to read to a group of year 2 children who were on a Library Visit. I read my as yet unpublished story ‘Demolition Dan’. On their return to school the children did some drawings to illustrate the story and I have now shared some of these on my School Visits page. Pop over and have a look here. I seem to have got myself a little out of phase here in that I have reported on my Library visit of 16th March before reporting on my Book Signing on Saturday 11th March. 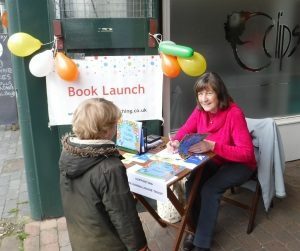 The signing session was to celebrate the official launch of “The Thirsty Flowers”, my illustrated story for 3-5 year olds and was held on my local High Street at the children’s clothing shop that stocks my books. I actually set up my stall outside the shop, in the entrance to the small arcade where the shop is situated on the corner. I was there for two hours in the morning, from 10.00am until 12.00 noon, and I sold (and signed) several copies of the book so I was well satisfied with my mornings work. The photograph shows me signing a copy for a young customer. As previously reported I also held an on-line ‘virtual’ launch on my Facebook Author’s Page so I am pleased to say that the book is now well and truly launched! Yesterday saw the second of my three visits to the Library. This time it was a group of 9 year olds from my local Primary School who were having a morning at the Library. The local Poetry Group, of which I am a member, had been invited to do some poetry work with the children and five of us went along. We shared some poetry with them on a variety of topics and listened to them read some of their own poems which they had been working on at school – acrostic poems on the subject of ‘Future’. They had obviously put a lot of thought into their poems and achieved some good results. We also talked to them in general terms about poetry and they were happy to share their thoughts with us on the kind of poems that they like. I have also received some wonderful ‘Monster’ pictures from my previous visit when I read to a class of 6-7 year olds and I will choose a few to post on this website in a day or two. If you have been reading this blog you will already be aware that the official launch for ‘The Thirsty Flowers’, my new illustrated story book for 3-6 year olds, takes place on Saturday 11th March when I will be running a book signing session in my local children’s clothing shop where the books are currently stocked. I will also be holding an on-line launch on my author’s page on Facebook where you will find a free book ‘giveaway’. To be in with a chance of winning please visit my page at www.facebook.com/ealeaper, like and share the page to your own timeline and leave a comment on the post. You have until midnight on Saturday to take part. I look forward to your visit to my on-line launch event. This morning I visited my local Library as I had been invited to read to a class of school children on a Library visit. The planned visit had been subject to change at short notice. I had been expecting to read my new book ‘The Thirsty Flowers’ to the Nursery Class from my local school and to read a new story for slightly older children to a class of 6-7 year olds on May 4th. Just last week I learned that the school had swapped the dates round and I had the class of 6-7 year olds today. I had expected another month or so to polish the story, ‘Demolition Dan’, as it was not quite ready for public airing but suddenly I had to give it my full attention. I have to say I am happy with the work I have done on the story in order to get it ready to read and the children seemed to enjoy it. Hopefully it will eventually be turned into another illustrated story book. Apart from the sudden need to give the new story my full attention I was a little bit sorry that the dates were changed round as the reading of ‘The Thirsty Flowers’ today would have tied in well with my book launch this coming Saturday, 11th March, when I will be signing copies of the book and giving away balloons in a local shop where the book is stocked. Despite the change of plan it was an enjoyable morning and it was great to see young children being encouraged to find out what their local library can offer.